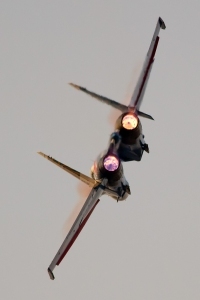 Farnborough International Ltd can confirm that two of the Russian Knight’s Su-27s will be displaying at the Farnborough International Airshow 2012. Their only visit to the UK this year, one aircraft will be on static display and the other will take part in the daily flying display on all seven days of the show. You can read more about the Russian Knights in our own article.